Crescent Decorative Matboard offers excellent protection for the majority of framing jobs and provides unlimited matting combinations to enhance artwork and complement interior decor. It can also be used for posters, decorative art, and craft projects. These classic boards have a fine-quality surface paper that is highly fade and bleed resistant. The white core is made of unprinted, reclaimed wood pulp fibers and, along with the backing paper, is buffered and acid free. Individual boards are 4-ply, .052"–.060" (1.3 to 1.5 mm) thick. Color Note — Color Swatches are created with actual product. Due to the many variations in monitors and browsers, colors may appear slightly different on different computer screens. 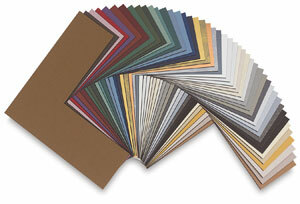 Crescent matboard comes in hundreds of colors, but, besides color, how do you choose which board best fits your needs? Connie presents Crescent's Decorative line, Select line and RagMat line and explains the benefits of each to help you make the right decision for your artwork.